Lime is an oval, green citrus fruit. It has a sour, intensely tart flesh and used in making cocktails or mixed drinks and in pastries and cooking too. Its zest has a floral aroma. They are 3-6 centimeters in diameter and a good source of Vitamin C.
Limes are used commonly in ceviche for its pickling properties. The leaves are found in Asian cuisine. In the 1800s, British sailors were given some citrus each day (nicknamed "limey") to prevent scurvy. India is the top producer of limes. Limes are a small citrus fruit whose skin and flesh are green in color. They are oval or round shape with a diameter between one to two inches. Choosing: Look for limes that are firm and heavy. The skin should be green and glossy. Buying: Limes are available in the marketplace throughout the year but peaks in production from mid-spring through fall. Limes will produce more juice when they are at room temperature. One can also place the lime in a bowl of warm water for a few minutes then roll them under the palm of your hand on a flat surface to help squeeze out more juice. Cleaning: Wash the skin thoroughly to remove any dirt or bacteria on the surface. Limes can be kept inside the fridge for 10 days. They tend to ripen quickly in warm weather or when exposed to sunlight. Lime juice and zest can be stored for later use. Lime juice can be frozen and lime zest stored in an airtight container inside the fridge. 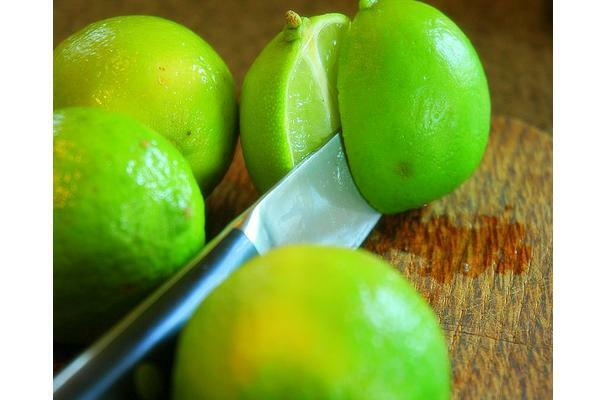 Limes were first introduced to the United States in the Florida Keys during the 16th century. This started the advent of Key lime recipes.